Little cocoa fudge dreams! The perfect cookie! Rich, super chocolatey, moist, chewy...the texture of these cookies was unbelievable (yay, my cookie-baking abilities are improving). They were crisp on the edges, and thick and chewy everywhere else. The cocoa flavor is definitely emphasized here, and they aren't terribly sweet...so for those of you dark chocolate lovers (or not...I hate dark chocolate and still couldn't get enough), these are for you. These cookies are eggless, and plain yogurt is added to provide the "wet" for the batter. In fact, maybe that's what helped contribute to the moistness of the cookies. 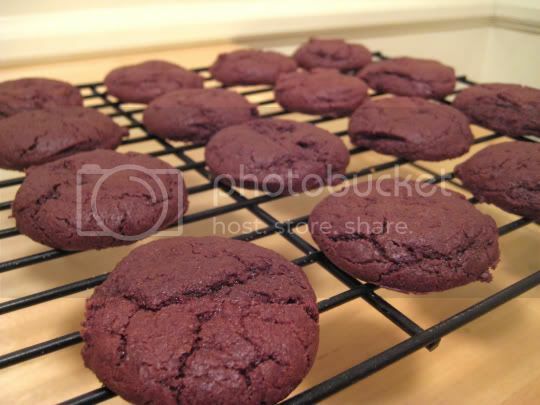 And not only were these cookies amazing, but they were extremely easy to make. I kid you not, the entire batter was prepared in a pot (the one used to melt the butter and sugars together). And these were a hit at work! Make again? Definitely. Simple, easy, and I loved that I had every ingredient on hand. And even better, these cookies are only 80 calories each!